Freestanding sort modules are designed to provide for maximum sorting capability in a minimal footprint. Available in 3 or 4 column configurations, widths between 36" - 56" and heights from 48" - 76". Supports standard, legal and oversize shelves. 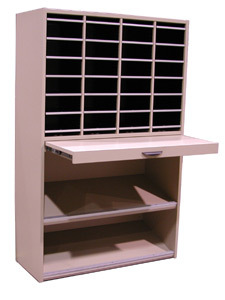 Freestanding sort modules or literature racks are also available with base cabinets below for storage of packaging materials. allow for easy shelf adjustment. track and clear index cover and are rated for capacity loads up to 35 lbs. capacity loads up to 50 lbs. Freestanding Sort Modules (FSM) come in 3 or 4 column configurations. can be purchased separately or in packs of five. 48, 60, 66, 72 and 76. out reference shelf or 12 kickplate. FSMs are available in standard, legal or oversize configurations for standard 8-1/2 x 11 size documents, legal size documents and oversize documents like newspapers and periodicals. Side Panels: Constructed of 1 thick industrial grade 40-50 lb. sub-straight, double-faced melamine. Framed by matching 1.5mm PVC edge banding. Top and Bottom Panels: Constructed of 5/8 thick industrial grade 40-50 lb. sub-straight, double-faced melamine. Framed by matching 1.5mm PVC edge banding. Back Panel: Constructed of 5/8 thick industrial grade 40-50 lb. sub-straight, double-faced melamine. Vertical Dividers: Constructed of 5/8 thick industrial grade 40-50 lb. sub-straight, double-faced melamine. Framed by matching 1.5mm PVC edge banding. FSMs are shipped fully assembled.